Computing history tells us of a mythical place where many of the innovations we take for granted today were either invented or refined to a working level at a single location known as the Xerox’s Palo-Alto Research Center (PARC). These discoveries form the basis of much of the technology we use today and include the desktop metaphor, the graphical user interface, laser printers, object orientation and Ethernet. Xerox manufactured a number of high-end machines including the 1973 Xerox Alto which, being GUI based, shipped with a number of proportional bit-mapped fonts. What is interesting to me however is the mono-spaced font used by the SWAT debugger (but not by the command prompts, they were proportional – ahead of their time!) and so, based on a screen-shot of SWAT, I thought it needed to live again! I’ve had to make up a few of the symbols and letters that weren’t shown and filled out the symbols for the Windows 1252 Latin-1/ISO-8990-1 code-page and with the absence of any solid information online give it a name so here is Alto Mono! When using the TrueType version choose 6 point on Windows and 8 point on Mac OS X. The Xerox manuals are also fun to browse though with such section headings as “Things the user doesn’t really need to know…” and “How to get out of trouble” and the comments about SWAT’s odd syntax and interface. 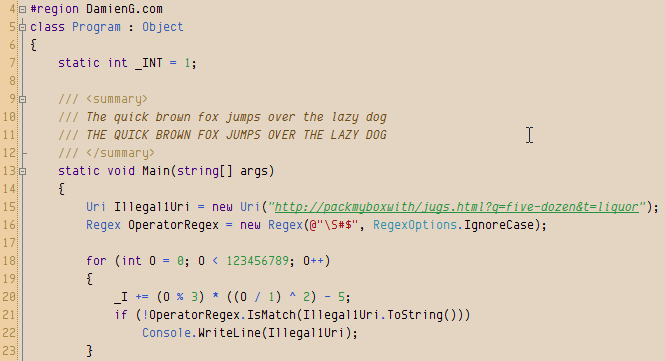 It’s been a struggle but finally after countless hours here it is, the next release of my Envy Code R monospaced (fixed-width) font designed for programmers. Many glyphs have been redrawn since preview 6 including braces, lower-case y, 6 & 9, ampersand, dollar-sign, hash etc. One pixel was removed vertically height to make the box drawing balanced and allow more lines per screen. These new box-drawing, shading and symbols make Envy Code R a great font for the command-prompt (Consolas and Lucida Console lack box-drawing completely). To use them you will need to run the included registry file and reboot to operate correctly from a command prompt’s properties dialog. 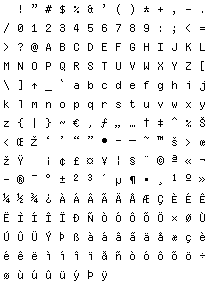 This typeface contains over 550 glyphs providing full complements for DOS, Windows and Mac versions of the US, Western, Central Europe, Turkish, Baltic, Icelandic and Nordic code-pages. This hits several Unicode ranges including Basic Latin, Latin-1 Supplement, Latin Extended A & B, Box Drawing, Block Elements, Letter-like Symbols, Number Forms, Arrows… although not all of these ranges are complete yet. As well as regular and bold variants this version includes a full italic version too and the obligatory italic-as-bold hack to get italic syntax highlighting in Visual Studio as shown here in my favorite 10 point with my Humane theme. And for those of you that like the font a little larger it now looks good and the odd sizing issues are all gone! These files are free to download and use from damieng.com but CAN NOT be redistributed either by other web sites or be included in your package, download, product or source repository. I am now settled into my new, albeit temporary, apartment here in Vancouver, BC working for Microsoft! For those who haven’t been following my blog long I took a job at Microsoft Canada Development Center as a developer on LINQ to SQL. It turns out my H-1B Visa has been approved and I will be moving down to Redmond in October. Joining a company of Microsoft’s size is a daunting experience. The sheer number of people, departments, systems, procedures and intranet sites to navigate and learn plus of course the actual job of jumping into the product and seeing where we go from here. I’ve also been helping out a little on the forums and internal lists and getting involved in the regular scheduled update meetings. Of course you also hear all sorts of interesting news just before it becomes public knowledge such as publishing XNA apps to Xbox Live! and Office getting ODF and PDF support. A whirlwind couple of weeks full of new employee orientation, relocating, getting lost, filling in forms, exploring, meeting a couple of hundred people and catching up with a few old friends including one from Guernsey all of which lead to a quiet blog. There have been some personal stories of getting lost, baby sharks and falling in lakes which will be kept to email now – there’s no way those 500+ subscribers are here for my personal bits! I’ll be sending out an email this week so if you haven’t seen something by the weekend and we’re friends ping me and I’ll forward you on a copy. Some photos are up on Facebook with a few more to follow. Of course what everybody really wants to know (according to my inbox) is where Envy Code R preview #7 is. It is coming, but every time I think I’m close to a release I find another annoying glitch all related to hinting. Hinting is the process whereby you tell the rendering system how to shape the characters to better fit into a pixel grid. It consists of a table saying at which sizes to smooth and apply instruction plus a program that adjusts the font as a whole for a given size and then a program per-glyph that tells it how to adjust the points in relation to each other with delta hints providing modifications for specific point sizes. It’s a complicated process if you’re doing it at the lowest level with a tool such as Microsoft’s Visual TrueType but is made easier with a tool like FontLab Studio 5 which has an auto-hinter that often gets things wrong but is a lot easier to work with and works with hints at a higher level of abstraction. Which is why I parted with $999 on FontLab and I’m going to investigate a donate option to try and recoup some of those costs. The bold variant is the only one now requiring hinting and I’m hoping to have it done in the next 24-48 hours. The regular variant looks just great… as does italics.